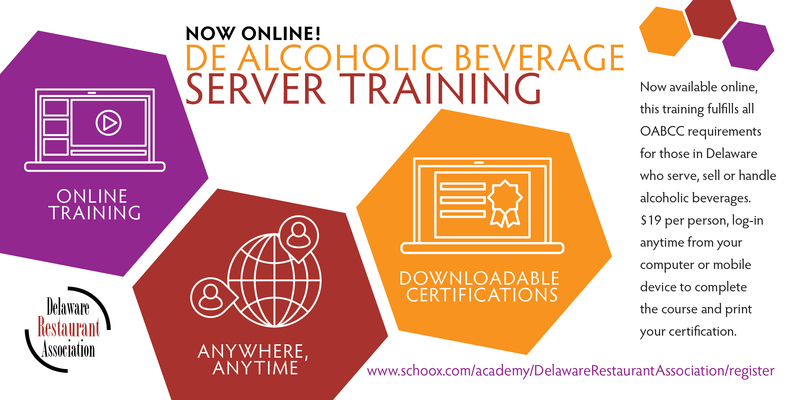 Online Alcoholic Beverage Server Training was developed by the Delaware Restaurant Association in partnership with InnovaLearn and the Schoox online training academy, meeting the demand for quick & easy training options for all servers, bartenders, and those who handle alcohol in Delaware. This online course replicates the information from the Office of the Alcoholic Beverage Control Commissioner (OABCC) at the traditional “in-person classes” but is available anytime, anywhere! Take the test from your computer or mobile device,and print your certificate the same day. Show your printed certificate or pull up on your phone“works in exactly the same way as the ˜server cards issued by the Department of Alcohol & Tobacco Enforcement (DATE) officers. The convenient online course & exam can be completed in about an hour – no more 3+ hour classes, not to mention trying to find parking and make it to the class on-time! Online Beverage Server Training is available 24/7, at a cost of only $19.